Based on the graphic novel by Alan Moore (who also wrote Watchmen and From Hell) and adapted for the screen by the Warshowskis (creators o f the Matrix), this film stars Hugo Weaving as the titular hero V. Though V’s face is never seen, Hugo Weaving’s performance manages to humanize him. His love interest, Evee, is well played by Natalie Portman, as is his nemesis Chancellor Sutler by John Hurt. Stephen Fry provides excellent support. The dystopian future England is all too believable. 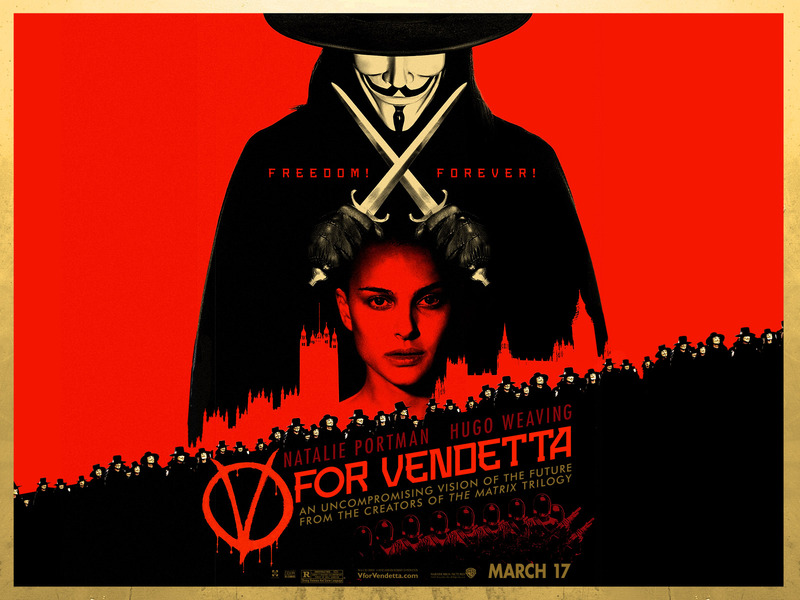 V is ruthless, even monstrous, and yet still inspiring as a symbol of resistance to oppression, no matter the cost. This entry was posted in movies and tagged alan moore, dystopian, hugo weaving, John Hurt, movie review, Natalie Portman, Stephen Fry, V for Vendetta, warshowski. Bookmark the permalink.